Banana chips or plantain wafors recipe - Banana chips is an easy to prepare snack which is very tasty. When I serve some crispy snacks with hot cup of tea or coffee to my family and friends, it gives me immense pleasure and satisfaction. Chips are also called as wafors. 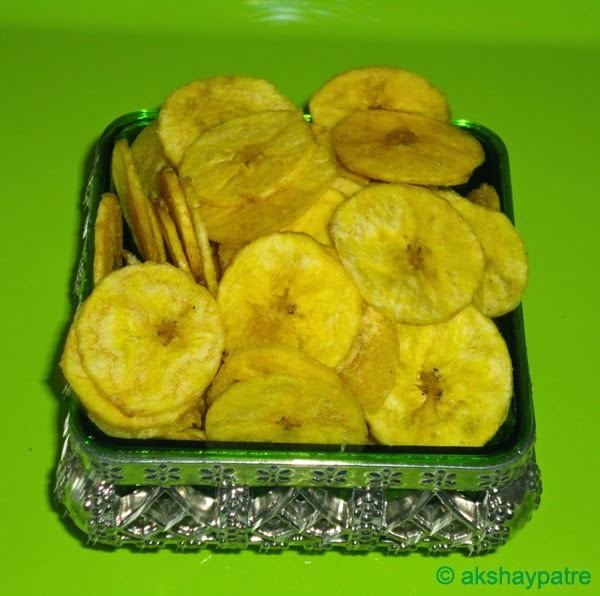 In Kerala, Tamil Nadu and some parts of Karnataka, a variety of banana called nendra baale (plantain) is used to make these chips. But, here I don't get that variety. So, without any option, I make chips with banana which is easily available in the vegetable market. 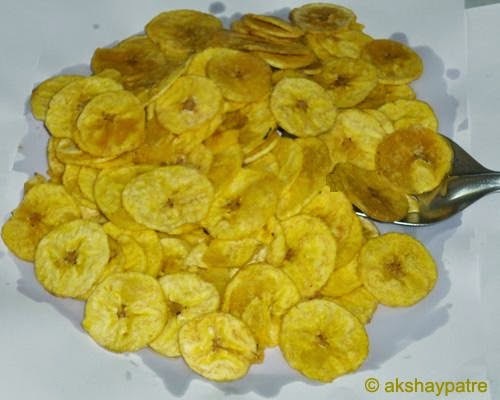 In comparison, chips prepared with nendra banana is more tastier than the chips prepared with other varieties of banana. Wash the bananas and pat to dry with clean kitchen towel. Take a large bowl and put 2 cups of water. Add the turmeric powder and mix well. Peel the bananas and scrape out to thin round slices and put them in turmeric water. Set aside for 2 - 3 minutes. Drain the water and pour some plain cold water on the banana slices. Drain and spread the banana slices on a paper and set aside for 15 minutes. In the meantime, dissolve 1/2 tsp salt in 3 - 4 tbsp of water and set aside. Heat coconut oil in a frying pan and fry the slices on medium flame till half done. When you hearing ssss sound, sprinkle 1/2 teaspoon of salted water, immediately you'll hear bubble bursting sound. it precipitate after a while. Fry the chips for a minute or till crispy. Drain on an absorbent paper. When the chips come to room temperature, store in an airtight container. 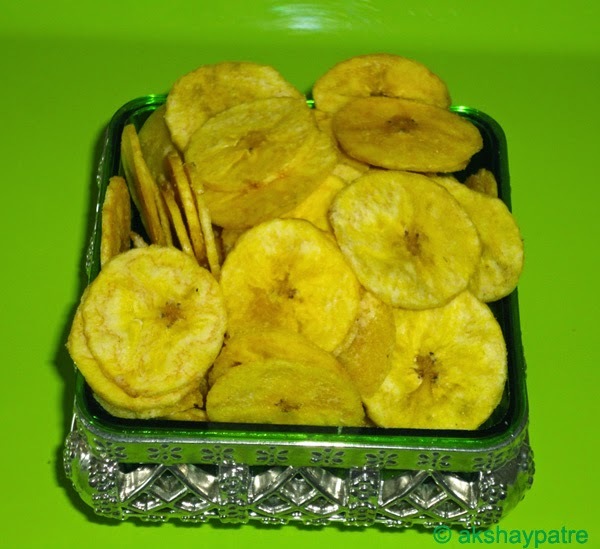 Serve banana chips with hot tea or coffee. 2. Take a large bowl and put 2 cups of water. Add the turmeric powder and mix well. 3. Peel the bananas and scrape out to thin round slices and put them in turmeric water. Set aside for 2 - 3 minutes. 4. Drain the water and pour some plain cold water on the banana slices. Drain and spread the banana slices on a paper and set aside for 15 minutes. In the meantime, dissolve 1/2 tsp salt in 3 - 4 tbsp of water and set aside. 5. Heat coconut oil in a frying pan and fry the slices on medium flame till half done. When you hearing ssss sound, sprinkle 1/2 teaspoon of salted water, immediately you'll hear bubble bursting sound. it precipitate after a while. Fry the chips for a minute or till crispy. Drain on an absorbent paper. 6. When the chips come to room temperature, store in an airtight container. Well explained post!! Love this chips to munch on! Perfect crunchy chips, so thin, loved it. Looks nice and crispy ! I simply love them..